Clarklift UK, the UK distributor for the popular Clark forklift, approached New Media Designs with a view to designing a CD-ROM to accompany a feature article in the popular SDH magazine. 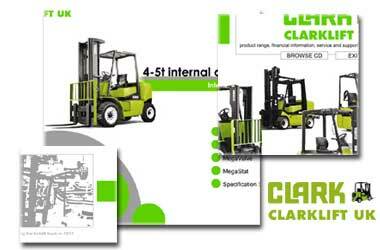 The aim of the project was to produce a product that would create a strong visual impact on the user, whilst promoting the Clarklift UK Brand. As an additional request Clarklift UK also specified that it must be easy to update the content as this may vary over the period of the project. As part of the project New Media Designs produced a number of visually appealing designs incorporating video, audio and textual content. When discussing the issue of updating content the ideal solution seemed to be the separation of content from design and therefore to incorporate this we used a combination of XML and Macromedia Flash. The resulting CD was successfully launched nationwide with the accompanying article and resulting in a substantial amount of sales revenue for the company (Clarklift UK). "New Media Designs has not only produced an excellent web site for us, but has quickly understood the nature of our business and the markets which we wish to serve..."
We are frequently contracted by advertising agencies to undertake a wide range of projects, we can consult, design and develop professional solutions to your specifications, re-create brochure material and even develop from your designs or artwork. We are confident that we can provide a professional service at all levels. Agencies wishing to contract New Media Designs Ltd can contact mark.r@newmediadesigns.co.uk.